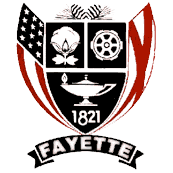 The city of Fayette endeavors to provide services for its citizens by aligning various responsibilities through several departments. These have been established to meet the needs and pleasure of the people and to provide for future enhancements of the town. The Fire department does more than just fight fires. Contact them for a inspections, educational meeting and a list of other services they provide. The Fayette Police Department seeks to interact with the citizens of Fayette to create a safer community. The Street Department is responsible for removal of refuse and debris along with maintenance of the city streets. Visit the Park and Rec for information on the Aquatic Center, when to sign up for seasonal sports and the use of Guthrie Smith Park facilities. The Fayette Water Board oversees the water needs for Fayette and surrounding areas. The Fayette Gas Board provides gas and gas related services for homes and industries. Visit the Municipal Court for court officers, court session dates and for paying fines. The plants, flowers and decorations around our town are part of a project to make Fayette more appealing. You can help. The building and construction guidelines are all available here.